Without a doubt, a knife is one of the most effective and handy tool for any Outdoorsman. 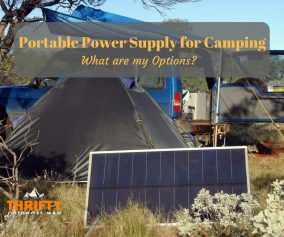 Its important to carry one with you, especially when you go out for camping, hiking or exploring the wilderness. It becomes your best friend. The variety and types of knives available on the market are innumerable, each one is different. You'll need a knife sharpener to keep your blade sharp. The best way is to carry a pocket knife sharpener with you. Below is a list of the best pocket knife sharpeners. Knives make our life a whole lot easier, but it can be one of the most difficult tools to handle. If the blade is dull, or if your like me, than you will know that a dull blade is not only a big put off but it can also be dangerous to keep using a dull blade. You have to put significantly more force into cutting when using a dull blade. Sharpening the knife at home is not such a big problem. You can easily store a knife sharpener (no matter the size!) in any place. The problem arises when you're outdoors. That is the time when you can only carry limited gear and that too has to be compact and light to fit in. As we already discussed, your knife is your best friend when you are out and about exploring nature. However, a knife alone cannot be helpful enough. You need to carry a pocket knife sharpener to keep your knife blades in perfect working condition. Interestingly, there are as many pocket knife sharpener verities as there are knives. Picking the best pocket knife sharpener from a pool of different choices can be mind boggling. There are actually a variety that are small enough to fit inside your pocket and also manage to sharpen your knife to perfection. To begin with, choose a pocket knife sharpener according to the type of knife that you will be using. You will also need to consider the style of blade that you prefer. Some like the sharpness and finesse of a straight edge blade while others prefer the rawness of a serrated edge (jagged teeth) blade. Or you might be one of those people who like to carry multi-tool with multiple edge style. Whatever your preference is, there really is a best pocket knife sharpener for everyone! Just to clarify, when we say pocket knife sharpener we REALLY mean a knife sharpener that is small enough to fit into your pants pocket and light enough so that it can be carried around effortlessly. 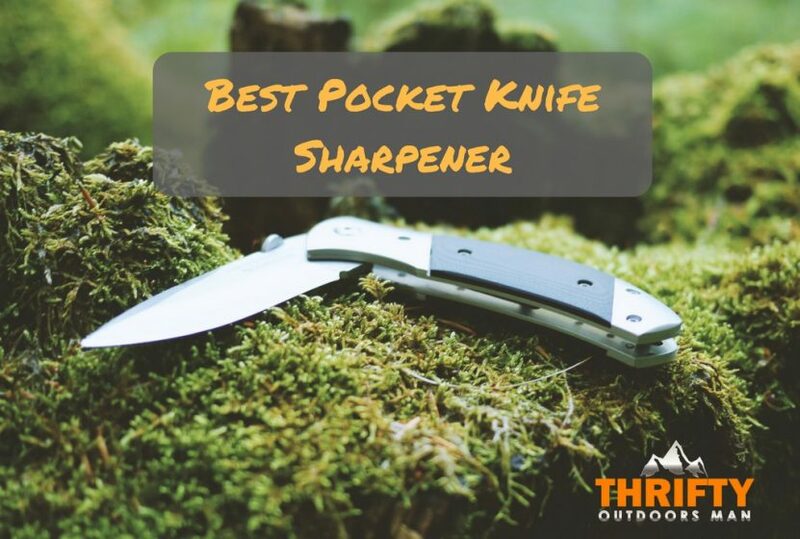 Here is a list of the top 7 best pocket knife sharpeners that are portable and work fantastically to give you sharp blade throughout your trip. Smith’s PP1 Pocket Pal is a multi-functional knife sharpener that features a tapered diamond rod for sharpening serrations and gut hooks. Its carbide blades quickly set the edges, preset crossed carbides and ceramic stones, which provide the perfect edge every time, and a ceramic finish makes it a must have light weight tool for any backpacker, hiker, survivalist or hunter who wants their blade to be the sharpest around. The Blademedic Knife Sharpener is the first Responder for Field Repairs on all types of Knife Blades. It’s like having an entire Sharpening Kit right there with you to tackle Regular or Serrated Blades, Gut Hooks, or just about any Knife. Weighing in at four ounces, the Lansky Blade Medic is not the lightest pocket knife sharpener on this list, however it is highly recommended. The Diamond Tapered Rod is superb for reconditioning and maintaining a sharp facet on the go and the ceramic serrated knife sharpener permits you to get inside the smallest serration. About 5 or 6 strokes via the Tungsten Carbide V part rod will restore any nicks to your blade at the same time an extra three or four strokes through the Ceramic V section rods will sharpen your blade to an excellent point. The metal casing on the Blade Medic feels better than a plastic casing and also feels tougher, this doesn't compensate for the additional weight it adds on. The extra length that is added by way of the serrated ceramic edge is just not all useless weight though; it presents clear skills to the tapered rod’s usability by way of permitting for longer strokes alongside a constant blade. The Pocket Pal X2 is the next generation of Sharpener and Outdoors Tool. Like the current Pocket Pal, the new X2 is lightweight, compact, and durable, but this new version comes with several, really cool features. It features the same COARSE and FINE pull-through sharpening slots and fold out, tapered diamond rod as the current Pocket Pal but adds a fire starter, compass, LED light, and signal whistle to its compact frame. 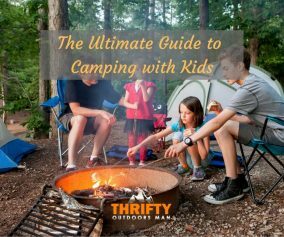 It’s the perfect tool for survivalists, backpackers, hikers, campers, and outdoor sports enthusiasts. The Smith’s Pocket Pal X2 is more than just your average Knife Sharpener, the Pocket Pal X2 also includes some essential pieces to make in an all in one survival tool that is meant to accompany your knife. 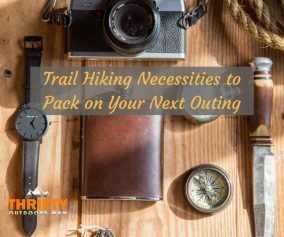 Along with the same knife sharpening tools as on the original Pocket Pal (tapered diamond rod for serrations and gut hooks, carbide plates, ceramic plates), you also get some survival gadgets that will no doubt come in handy at some point. A fire-starting flint rod, compass, signal whistle and micro LED torch only add on an extra 3/4 of an ounce and could potentially save your life one day. If you don’t already have these individual items or you like the idea of combining them all into one then this is the best pocket knife sharpener for you. The Fallkniven DC4 Diamond Ceramic Whetstone is a popular dual surface combination sharpening stone that is a favorite for, well anyone with a passion for knives. The double sided difference provides a 25-micron diamond surface for honing a dull blade and a fine ceramic whetstone for achieving a truly sharp edge. Small and lightweight at only 2.3 ounces (65 grams) but lacking any sort of handle, grip or attachment point, you are supplied with a small leather pouch for storage which helps prevent damage. A simple and low maintenance pocket sharpening tool that can be used wet or dry and does not require oil, this is always going to appeal to the knife enthusiast or bush crafter who is thinking long term. The only reason the Fallkniven DC4 doesn’t rank higher on our list is that it is not as practical to keep in your pocket as other key ring pocket knife sharpeners. Over the years, both the needs of an average adventurer and technology have changed. The Swiss Army Knife has evolved by responding to these needs, while remaining an essential tool that everyone can rely on. 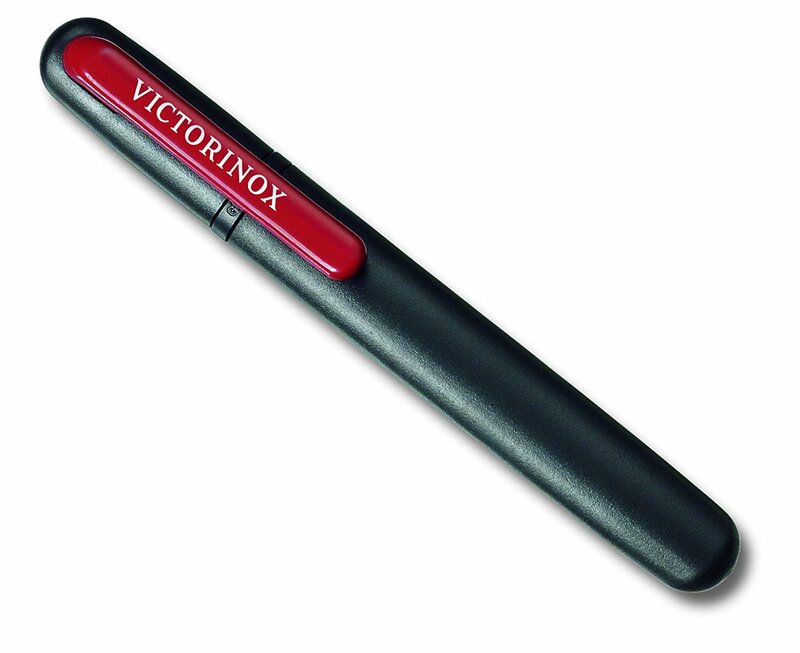 The Victorinox Pocket Knife Sharpener is handy pen shaped design with a simple pocket clip lid and interchangeable rod / edge finisher. The plastic construction does not feel anywhere near as solid as with other knife sharpeners, but it does provide an elegantly slim line profile that can be tucked into your pocket or tool belt. Weighing just 0.8 oz. or 23 grams, the DMT F70F pocket knife sharpener is a lightweight fold away fine diamond sharpening stone that measures just 3.5 inches long. With DMT’s mono crystalline diamond surface, no oil is needed; you can get a razor sharp edge by using it dry or with water. The fine diamond surface gives the crystals a larger surface area to be sharpened up to 6 times more effective as regular sharpening stones. Made in the USA, the solid construction will provide a consistent performance for many years, even when used on garden tools like spades and axes. Quick Fix combines two great sharpening technologies - tungsten carbide to sharpen the blade and ceramic to smooth the edge. The versatile, compact Quick Fix sharpener, from Lansky, combines two sharpening technologies -- tungsten carbide to hone the blade to a fine point, and ceramic to smooth the edge for a long-lasting keen. A molded rubber grip ensures solid, slip-free use, and it takes only three or four strokes to get your blade razor-sharp. 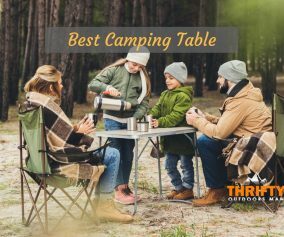 Best of all, you can take it with you anywhere, as it stows easily in your pocket, tackle box or Backpack. Pocket knife sharpeners should be an essential part of any outdoor kit. For survivalists, backpackers and hikers this handy tool will be your best friend no matter where you travel. They are versatile, they are handy, they are portable and they take minimal space. Do you own any of the mentioned best pocket knife sharpeners? If yes let us know in the comments if you like it and how well it works.